Soil and Water Conservation in the U.S. The United States was blessed with abundant fertile soil when the colonists first arrived, and the need to maintain that fertility did not immediately arise. Soon after the introduction of farming, however, it became clear that crops and soil cultivation had a devastating effect on the quality of the soil if planted year after year without interruption. In spite of this discovery, as long as the frontier presented fresh fertile land to resettle on, the problem of soil degradation wasn't an immediate crisis. In the late 19th century, however, the era of an open frontier that permitted large-scale homesteading was over. The situation was exacerbated by the high prices paid by Europeans for food during World War I, which led to an expansion of land under cultivation beyond what could be sustained in peacetime. 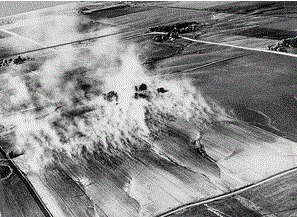 The onset of the Great Depression coincided with a combination of bad weather and the culmination of bad farming practices that produced the Dust Bowl conditions of 1931 and 1933. 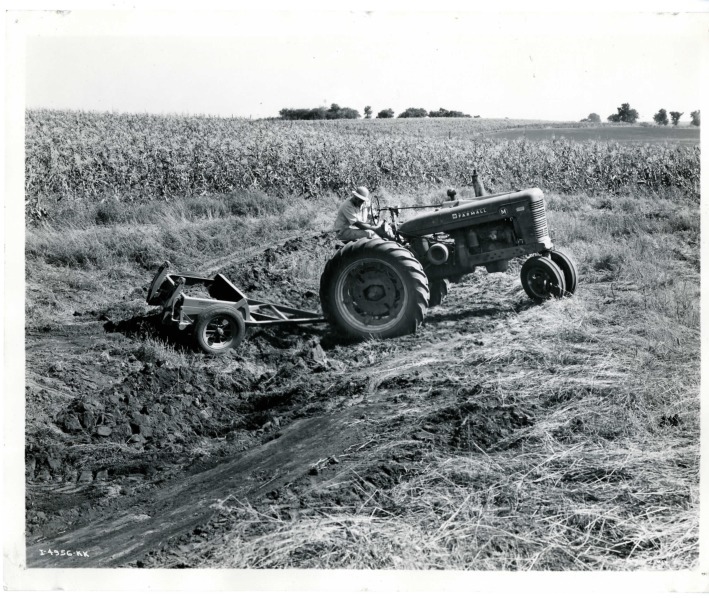 The first step in combating the problem was the Soil Erosion Service, established in 1933 to institute individualized conservation practices against soil erosion. The agency first began working with farmers in the SW Wisconsin watershed area. In 1935, the Soil Conservation Act was passed, accelerating nationwide soil conservation efforts for farmers. Renamed the Soil Conservation Service within the Department of Agriculture, the agency developed demonstration projects across the country in selected watersheds. Hugh Bennett in a Field in Oklahoma, 1943. The creation of the Soil Conservation Service represented the culmination of the efforts of Hugh Hammond Bennett, “father of Soil Conservation” and the first Chief of SCS, to awaken public concern for the problem of soil erosion. Bennett became aware of the threat posed by the erosion of soils early in his career as a surveyor for the USDA Bureau of Soils. He observed how soil erosion by water and wind reduced the ability of the land to sustain agricultural productivity and to support rural communities who depended on it for their livelihoods. He launched a public crusade of writing and speaking about the soil erosion crisis. 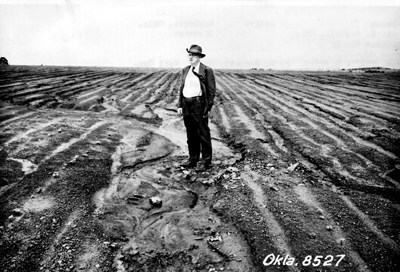 His highly influential 1928 publication “Soil Erosion: A National Menace” influenced Congress to create the first federal soil erosion experiment stations in 1929. Soil Conservation Act of 1935. 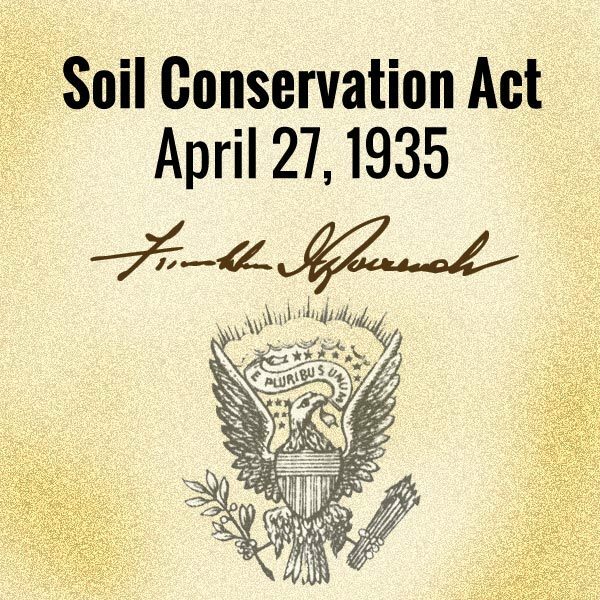 With the election of Franklin D. Roosevelt as President in 1932, conservation of soil and water resources became a national priority in the New Deal administration. The National Industrial Recovery Act (P.L. 73-67) passed in June 1933 included funds to fight soil erosion. With this money, the Soil Erosion Service (SES) was established in the Department of Interior with Hugh Bennett as Chief in September 1933. SES established demonstration projects in critically eroded areas across the country to show landowners the benefits of conservation. Then on April 27, 1935 Congress passed Public Law 74-46, in which it recognized that "the wastage of soil and moisture resources on farm, grazing, and forest lands . . . is a menace to the national welfare" and established the Soil Conservation Service (SCS) as a permanent agency in the USDA. Put Your Soil Conservation Distict on the Map. After 1935, SCS expanded its soil conservation program nationwide with a several-fold increase in the number of demonstration projects. Labor provided by the Civilian Conservation Corps (CCC), the Civil Works Administration (CWA), and the Works Progress Administration (WPA) supported this work. SCS’s technical experts worked to advance scientific understanding of erosion processes and to develop effective conservation practices. Also, as early as 1935 USDA managers began to search for ways to extend conservation assistance to more farmers. 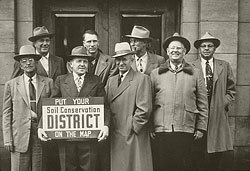 They believed the solution was to establish democratically organized soil conservation districts to lead the conservation planning effort at the local level. To create a framework for cooperation, USDA drafted the Standard State Soil Conservation Districts Law, which President Roosevelt sent to the governors of all the states in 1937.